Want the perfect location to see what Tenby has to offer? New listing for 2018. Welcome to our new listing for 2018, a recently purchased,updated and modernised 3 bedroom apartment right in the middle of Tenby town. Described as Tenby’s hidden gem St Mary's Apartment, Yorke House,is situated within the historic walls of Tenby, moments away from shops, bars, restaurants, beaches and the Harbour. 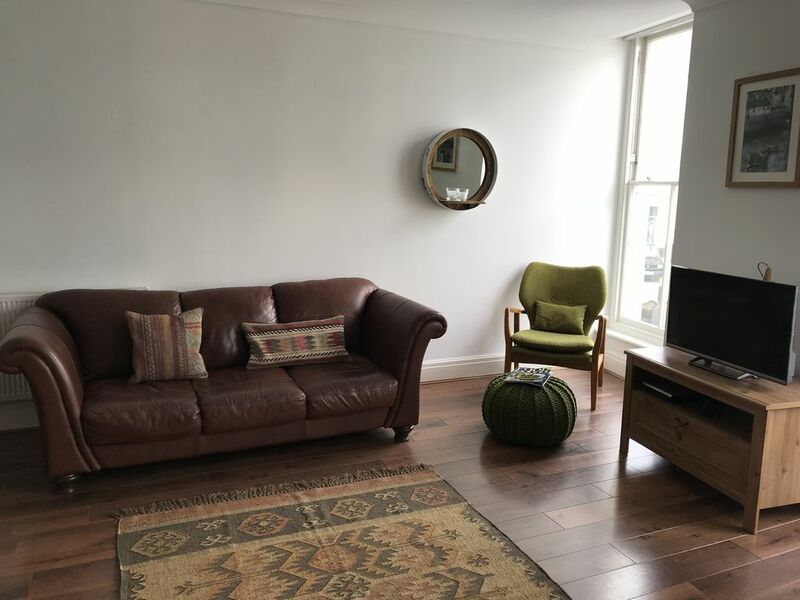 St Mary’s is situated on the first floor, this three bedroom apartment is the perfect location for people to meet, relax and enjoy the Tenby life, either by being a part of it, or just to sit back and watch it all happen, right in the comfort of your chair. They say, its the best place to watch the New Years Eve celebrations in the square. St Mary's in the front has a very large living area. An open plan kitchen, dining, sitting space, with views from the bay windows looking down at the life that goes on daily in this busy, buzzing seaside resort, and they wouldn't even know that you are watching. From the rear, in the master bedroom, you have delightful restricted sea views over the roof tops of the Tenby landscape, a view to your awaiting communal walled garden with patio/bbq area, where you can have a bbq with friends and family during your stay. It is a quiet, relaxing garden area considering you are in the middle of town. In between the master bedroom and the third bedroom is the family bathroom, with W.C, wash basin, bath with an over head shower. The kitchen is fully equipped for your culinary needs with an electric oven and hob, Electric kettle, toaster, microwave, dishwasher, washer/dryer and all other utensils that you will need during your stay. The dining area has a table big enough six people and a breakfast bar with a view onto Tenby’s Tudor Square. The sitting area, has a very comfortable sitting area to either watch the world go by, or to watch a film from a selection of DVDs that's available, or just to watch your favourite freeview channels. Nearest parking is available at the Multi-storey Car Park which is situated next to the Sainbury's supermarket, SA70 7LT, where you obtain a day ticket from the paying kiosks, or you can purchase a parking ticket from the Tenby Customer Service and Information centre, which is located next to the multi-storey car park, which will give you up to a week to park on any long stay Pembrokeshire county council car parks within the county at an estimated charge of £25 per week, which is a very good deal. To seek advice prior to your stay, look up the Tenby Customer Service and Information centre via the web, which will give you the information you require. Another car park is available with weekly rates at the Rectory field car park, but is a privately own car park with higher parking rates. We look forward to welcoming you to Tenby. We booked this for a family break over Easter for ourselves and three children. This was the perfect apartment in the centre of Tenby. Lovely clean, modern apartment furnished to a high standard. We would recommend it. Perfect location, beautiful apartment, everything you need. We’ll be back. We had a great girlie weekend away in Tenby, the apartment is beautiful, clean and modern. The rooms are well laid out. 3 bedrooms (1 double, 1 twin and 1 set of bunk beds) The kitchen has everything you could need to cater for six people (& more). Communication with the owner was brilliant and locating the apartment was simple, it’s less than a 2 minute walk from the long stay car park in Tenby, which at this time of year is £1.50 for 24 hrs or £6.50 for the week. We’ve already agreed to go back next year for our annual trip, as it really was the perfect weekend getaway. Fab apartment right in the heart of Tenby with its lovely town and beautiful beaches. Very comfortable spacious and clean apartment. We would highly recommend this as a place to stay and visit the area. Loved our stay at this apartment. Nice decor, good amenities, great location right in the middle of Tenby. I would recommend staying here to others! the property was first class and situated right in the heart of Tenby very modern and so clean and tidy. All what you required was at hand in the apartment could not fault any of it. Thank you for choosing to stay in our flat and for taking the time to write such a great review. Having currently work myself in hospitality, and am responsible for looking after and maintaining a holiday home, in Porthcawl, Alison has got it totally right at this apartment. Comfortable beds, cosy bedding, well maintained kitchen, even a travel cot and high chair, electric fan, iron, ironing board and hairdryers. The kitchen is a real treat, open plan, and the heart of the apartment. Great for chatting, with a glass of wine with family/friends. Thanks so much Alison, we will only be booking your place for future Tenby stays. Thank you very much for your very complimentary review it’s very much appreciated.we would welcome you to book with us anytime, and thank you for leaving the flat so clean .